So, hmmm, which one are we choosing? Well, just reflect on the unanimous parade of bishops at this year’s General Conference who espoused only #2 to the apparent exclusion of #1. We clearly know where the bishops fall. What about our General Boards and Agencies? Well, it is split — most opt for #2, but a couple like Church and Society and Global Ministries are still promoting #1. Our preachers? Well, at least the larger church pastors are primarily in the #2 camp — though there are a few exceptions. Whenever I write articles promoting a “vital” discipleship many people respond by saying I am expecting too much, that we will lose members if we take discipleship too seriously, that people don’t come to United Methodist churches wanting to be changed in any significant way. That’s too bad. 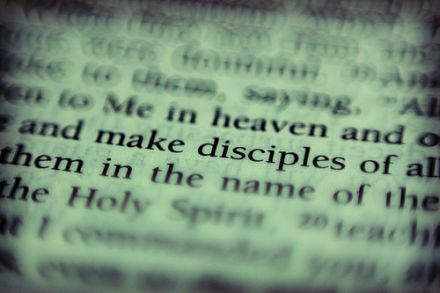 We chose our mission “to make disciples,” but when we realized that discipleship was hard and took work we huddled together and decided it was much easier to make discipleship easy and insipid. What once demanded we take up a cross — an instrument of our own potential destruction — in order to follow Christ has now been downgraded by a couple of our bishops to mean “attending church when it is convenient.” Jesus wept. Betsy: it’s not “why church” … It’s what community is Christ calling you in which to be a missionary. I just worked on a revision of a workbook for GBOD which helps churches chart out a course for discipleship in it’s true meaning (not just adding numbers). It should be out in late August or early September. It stresses discipleship as growing deeper in the faith and helps to plan just what a church can do to deepen that faith in its members. The workbook is CHARTING A COURSE. It may take several months to a year or more for a church to work through it, but I believe it will be worth it. The cynicism here is astounding. Please don’t set up a straw man or woman just so you can knock him or her over. If you are calling someone out, call them out. Everyone at the Board of Church and Society and Global Ministries is a 1 but as far as all the other Board and Agencies, Bishops, and in your opinion 95% of our pastors and churches are a 2? I don’t know how accurate this is because I know in my conference NOT one pastor I have talked to believes MEMBERSHIP = DISCIPLESHIP. I know our retiring Bishop doesn’t believe this and I highly doubt our incoming Bishop believes this. Bishop Goodpastor has said this to us and other conferences on multiple occasions. IMHO Discipleship formation requires RELATIONSHIP formation, and relationship formation begins with membership. Just in three hours this morning I have visited with 3 different people and talked about their walk with Christ: a man who doesn’t feel safe on our streets because he has been attacked, a woman who lost her husband three weeks ago, and another man recently divorced trying to get back in church. Last week I shared communion in a men’s shelter that couldn’t tell you where they stand on homosexuality, abortion, or even the political election. All these men wanted to know was that Jesus loves them and died for them so that their lives might be restored. None of these people would say they were perfect disciples of Christ, but then I don’t know that Jesus’ own hand picked disciples were always so perfect. Just suggest you might watch the feed of all the bishops equating discipleship with attending church or giving money or joining a small group at the service at General Conference. Every bishop was there, putting their paper boat in the bowl. Also, help me know where the concept of membership as we use it has anything to do with the gospels or the teaching of Jesus. Discipleship is certainly about relationship — I have said this here constantly. But 71% of UMs do not attend worship weekly, do not pray regularly, do not give sacrificially, do not serve missionally, have no interest in Bible study or spiritual formation, and will not step up in leadership. To call these folks disciples is your choice, but it is yours and it cannot be defended scripturally or theologically. This statement is shocking to read: “Discipleship is a gift, a privilege — it comes at no cost.” I cannot imagine someone saying this. I am not doubting you. I am simply in shock. Discipleship DOES come at a cost. At least that is my understanding personally and from the Gospels. Dying to self in order to follow Christ has been fairly costly, albeit totally worth it. I hope and pray to live out #1 and to be among others who are seeking to live out #1. What is the church if it is not living out #1? Thanks for thought-provoking and challenging words once again! At the end of the day, the Christian church has decided to die upon the hill of gay marriage. If discipleship means turning your back on your gay friends and family, then we cannot blame those who don’t seek to be disciples. I think you perhaps may not understand how “discipleship” plays among the unchurched – around here, it means membership in the he-man gay-haters club.